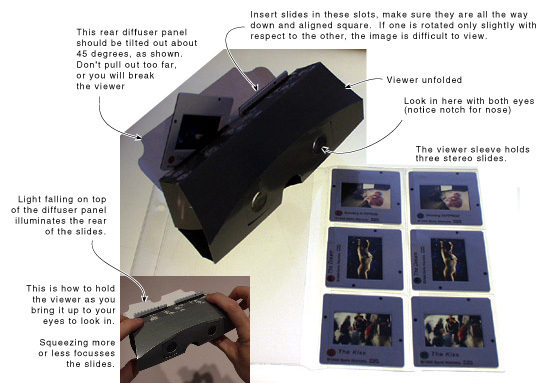 The SV4 viewer is a hard shell plastic viewer for 2x2 slides. Available for $12 with an order for stereo slides. This is a Eurostereo Viewer. The viewer folds flat and fits into a clear vinyl case, that also has pockets for three stereo slides. Available for $7 with an order for stereo slides. Brand new for 2001, compact folding prismatic stereoscope for viewing stereo pair images of any size - ideal for computer displays. It has optical glass prisms and an ingenious design: folds into a sealed, self-contained cube just 2x2x1.5 inches. Order from www.pokescope.com. Comes with stereo image processing software. Inexpensive plastic magnifying prismatic lorgnette for viewing stereo pair images with up to 3" separation. Available for $3.00 with an order for fine art Homes format prints or the CD-ROM. 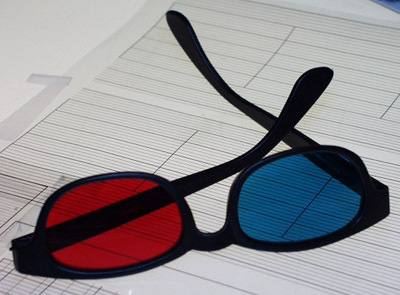 Brand new for 2001, these glasses incorporate several innovative features that make viewing your fine art anaglyph print a joy. Nylon frame and optical polycarbonate lenses for durability and clarity. Slight diopter on both lenses, which makes the print appear larger and sharper! Slightly greater diopter on red lens to compensate for red focus shift in eye. Cyan right eye lens which passes an amazing amount of color. These glasses are fantastic for color anaglyphs! Available for $7.00 with an order for fine art anaglyph prints or the CD-ROM. Similar to E3D, these glasses do not have a diopter in the lenses, and so are better for the nearsighted user. Available for $7.00 with an order for fine art anaglyph prints or the CD-ROM. Unless otherwise noted, all contents of this page, individual or aggregate, are copyright 2002 Dynamic Symmetry Productions. All rights reserved. All other product names mentioned in these pages are used for identification purposes only, and may be trademarks or registered trademarks of their respective companies, and the exclusive property of their respective owners.